Your Jeep's tires are constantly under attack every time you turn that key and drive down the road. Your factory tires are simply not ready to cope with gravel, rocks, potholes, tree stumps and whatever else the road throws at you. The team over at BFGoodrich has been making quality tires since 1896 and they know exactly how to meet your requirements and help you to get maximum fun on the highways and trails. Their tires offer a perfect balance of all-weather and all-terrain traction. Today we are back with the new offer on BFGoodrich! 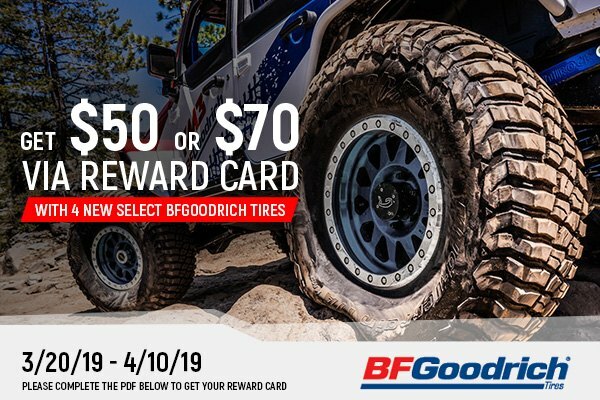 Right now you can GET up to $70 Mastercard Reward Card with the purchase of four (4) new BFGoodrich passenger or light truck tires. Hurry up, this offer is valid through April 10, 2019. Please complete this PDF form and follow instructions to get your card. Check this link for all tires at CARiD.